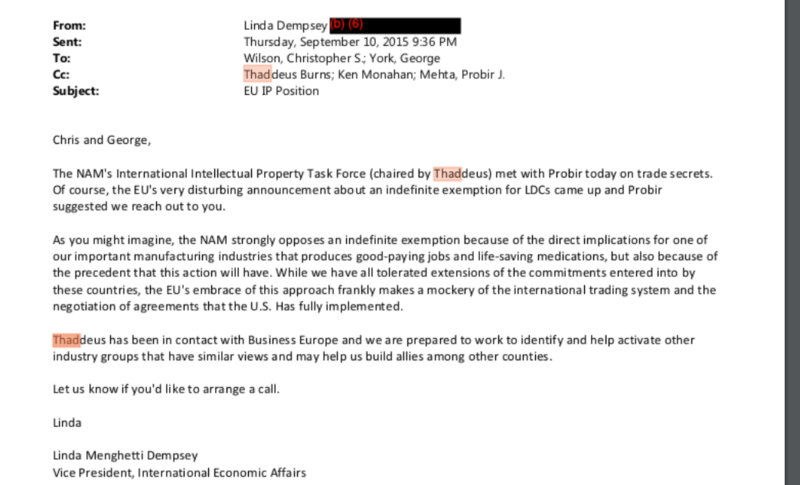 On September 10, 2015, the National Association of Manufacturers (NAM), wrote to USTR expressing alarm at the European Union support of an indefinite extension of a WTO waiver of obligations to grant patents on pharmaceuticals for UN defined least developed countries (LDCs). In 2015, there were 954 million persons living in LDCs, with a per capita income of $964, according to the World Bank. The EU had aligned itself with health advocates trying to protect the bottom billion access to life saving medicines. all notes and correspondence between the Office of the US Trade Representative and any non-government person or entity regarding the World Trade Organization’s (WTO) Trade-Related Aspects of Intellectual Property Rights (TRIPS) Council and the proposed Least Developed Country (LDC) request for an extension of the transitional period in the TRIPS Agreement for pharmaceutical products. Contained in the 72 pages of correspondence is a letter dated September 10, 2015, from Linda Dempsey (Vice President, International Economic Affairs, National Association of Manufacturers, NAM) to two USTR officials, Chris Wilson (Deputy Chief of Mission to the WTO) and George York (Deputy Assistant USTR for Intellectual Property and Innovation at USTR) opposing the request by least-developed Members of the WTO for an extension of the transitional period under Article 66.1 of the TRIPS Agreement for Least Developed Countries with respect to Pharmaceutical Products, and for waivers from the obligation of Articles 70.8 and 70.9 of the TRIPS Agreement for as long as a WTO member remained a least developed country. “The Commission agreed to support the least developed countries’ call for easier access to cheaper medicines by means of an indefinite exemption from World Trade Organization (WTO) intellectual property rules for pharmaceuticals. 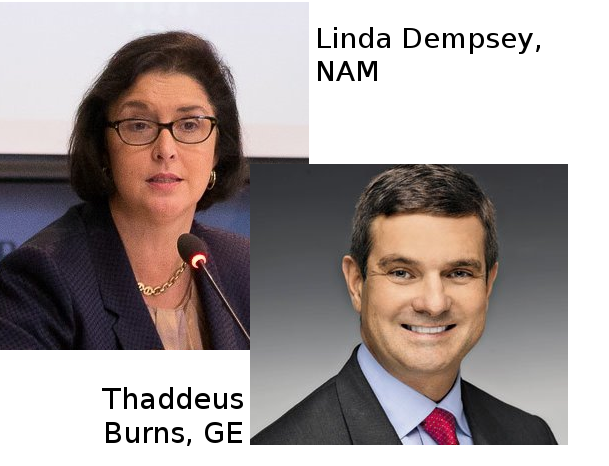 Concluding her message, Dempsey noted that GE’s Thaddeus Burns (who chaired NAM’s Intellectual Property Task Force) would engage with Business Europe to galvanize industry opposition in Europe to oppose the LDC Group’s efforts to secure an LDC extension that would grant an extension on the TRIPS requirements for LDC members until graduation. Dempsey started off her career as a Peace Corps volunteer in Togo, an LDC, where she worked on developing agricultural curriculum and taught “students and teachers on best agricultural practices” (Source: LinkedIn biography of Linda Menghetti Dempsey). A feature in The Hill – Global trade guru – provide some insight into Dempsey’s career trajectory from a Peace Corps volunteer in Togo to a seasoned Washington insider focused on denying LDC an indefinite exemption from TRIPS obligations on pharmaceutical drug patents. In 2015, this force of nature set her gaze upon the 954 million very poor people living in least developed countries. In June 2015, The WTO LDC Group gave this rationale for the drug patent waiver. The two other industry voices included in the email were Thaddeus Burns and Ken Monahan. Burns previously spent three years working for USTR, where he was known as an ardent ally of the pharmaceutical industry. Ken Monahan is currently Director for International Trade Policy at NAM. Previously he worked for the US Department of Commerce and for the House Ways and Means Committee. All three, Dempsey, Burns and Monahan, had worked for the federal government, the Congress, or both.